What you're looking at is not an art installation or set from the next Tron movie. It's the new RACE Robotics Lab in Singapore, used to display the latest industrial robots and train engineers working on automated assembly lines. According to architect Ministry of Design, the aim was to create "an engaging and future-forward spatial experience that denotes the idea of industrial automation and precision." Ministry of Design told Engadget that the lab's primary function is "to train and inspire more people to use robotics automation in their everyday work." The experience starts in the minimalist, all-black lobby that features just the lab signage (also created by the firm) and LEDs running at various crazy angles. A door leads to the highly unusual lab's black interior that's clad with a "second skin" of aluminum tubes and custom LED strips, also set at random, rakish angles. There is a method to the madness, beyond just wowing potential clients. The lab required a continuous interior with small hands-on training clusters, so the open-space plan is divided into smaller, multi-faceted interiors. At the same time, the panels "cloak the necessary but unsightly mechanical and electrical services while allowing ease of access for operation," says Ministry of Design. As such, each work cluster has separate hatches, allowing easy access to the services hidden behind. RACE Robotics is a collaboration between local educators and PBA Group, a Singapore-based firm specializing in contract manufacturing. The lab started running in January, offering novice and advanced training sessions in robotics and automation. It's working with industrial robotics giants, including Delta Electronics, Universal Robots and Kawasaki. 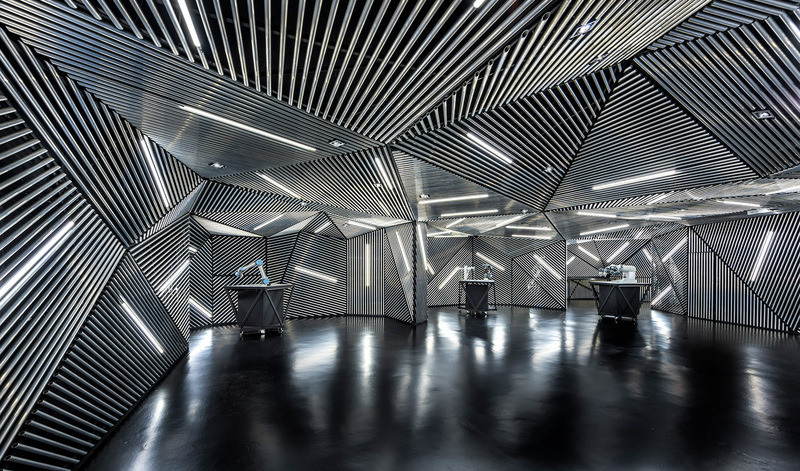 We're not sure what it's like to work and learn in such a dizzying interior, but if there's any place that justifies such a design, it's a robotics lab. "Overall, the space provides a suitable future-forward backdrop to usher in an age of automation and robotics," says Ministry of Design.